Habit: Tree, evergreen. Stem: trunk bark gray to red-brown, peeling in strips. Leaf: opposite, simple or compound; stipules deciduous; petiole 1--3 cm; blade +- gray abaxially, dark shiny green adaxially. Inflorescence: panicle, generally flat-topped; pedicel bractlets 1--3, at top. Flower: hypanthium bell-shaped, tomentose, bractlets 0; sepals persistent; petals +- round, white; stamens +- 15; pistils 2, ovary superior, style stout, stigma +- head-like. Fruit: follicles 2, 3--4 mm, woody. Seed: 1--4, +- 2 mm, compressed, +- brown. Note: Subspecies hybridize in cultivation; endemic to ChI. Habit: Plant 4--12 m. Leaf: 9--21 cm; 1° leaflets generally 3--7, 5--14 cm, linear; 2° leaflets generally 20--30, 4--12 mm, subopposite. Chromosomes: 2n=54. Ecology: Rocky slopes, canyons, oak woodland, chaparral; Elevation: 20--500 m. Bioregional Distribution: ChI (Santa Cruz, Santa Rosa, San Clemente islands). Flowering Time: May--Jul Note: Threatened by grazing. Citation for this treatment: Steve Junak & Dieter H. Wilken 2012, Lyonothamnus floribundus subsp. 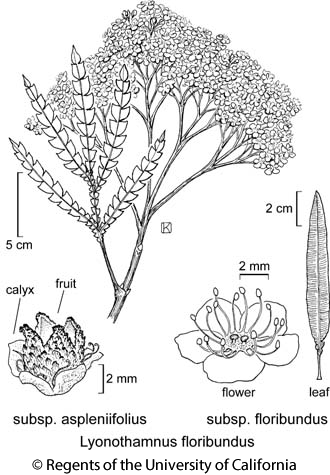 aspleniifolius, in Jepson Flora Project (eds.) Jepson eFlora, http://ucjeps.berkeley.edu/eflora/eflora_display.php?tid=51502, accessed on April 19, 2019. ChI (Santa Cruz, Santa Rosa, San Clemente islands). Markers link to CCH specimen records. Yellow markers indicate records that may provide evidence for eFlora range revision or may have georeferencing or identification issues. Purple markers indicate specimens collected from a garden, greenhouse, or other non-wild location.